I ordered the small size of the 2 in this style. 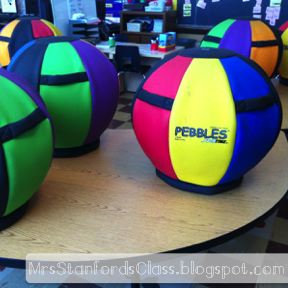 I chose the sitballs with covers because they are easy to clean, durable, and less likely to roll around the classroom. They do! This particular brand makes a larger size which I personally use for my teacher chair. I am 5'2" and sit just as comfortably on the 75cm size as my husband who is 6'2". Do they come in a cheaper version? Oh yes!! The noise difference is amazing! You don't have to hear dreaded chairs scrapping on the floor or me reminding them to keep chairs on all 4s, for that matter. The students are more willing to stay in their seats and their attention lasts for a bit longer because moving is welcomed. Do you have many problems with them? As of yet no. We do have a child lose their chair on occasion due to misbehavior or not following our 3 simple ball chair rules: do your work, don't disturb your neighbor, and sit on the black dot with feet on the floor. The ball chairs are super cute. I didn't even know those existed. Do they come in bigger sizes for older kids? I blogged on thematic teaching today. Your posts the other day inspired me. Ball chairs! What a great idea! I didn't know they existed I wish I could see them in action. Thanks for answering my question! I am looking more into a Donor's Choose project now to get me 5 for my classroom. I know I have a few students coming in who will GREATLY benefit! Thanks. Super cool chairs!! I've never seen them before! I'm creating a donor's choose this weekend for a few of these! I have a SEVERE ADHD child in my classroom. Since I found out I'm looping and I'll be with this child next year, I'm already trying to think of ways to manage him. Are they very heavy? I know another school that uses them for their classes and the teachers just love them. Great idea about using donor's money for this!! Wow! I've never seen type of ball before. I like the fact that it can't roll. Thanks for the information on the ball chairs! I have at least one student who would really benefit from one, I think. Abilitations is a great company, too! I love their products. Oh. My. Gosh! I so needed these past school year. I had about 3 kids with sensory issues...not to mention all the other kinder wiggles. Super cool! I just showed the pic to my 8yo daughter she guessed what they were straight away. Lol she's jealous of the lucky kids who get to dit on these ! Yes, I am just seeing this and I am now IN LOVE! I had the idea to use the ball chairs last year but was worried about the rolling around. These are awesome! My son's Montessori classroom uses regular yoga balls. I like these better! Loved your post so much I got a set for my small group table through donors choose. I just got them and brought one home to inflate. The problem is that the cover is kind of gappy and I don't know if its because the ball needs to be inflated more! Just wondered if you could share your experience inflating them! Thanks!